These pages are about a version of the Amiga called the "Walker". Only two prototypes were made and I happen to have one of these. This computer has a surprising amount of interest in it so I have produced these pages to document this highly unusual computer. The Walker (sometimes incorrectly known as "Mind Walker") is a prototype Amiga developed and shown by Amiga Technologies in late 1995 / early 96. 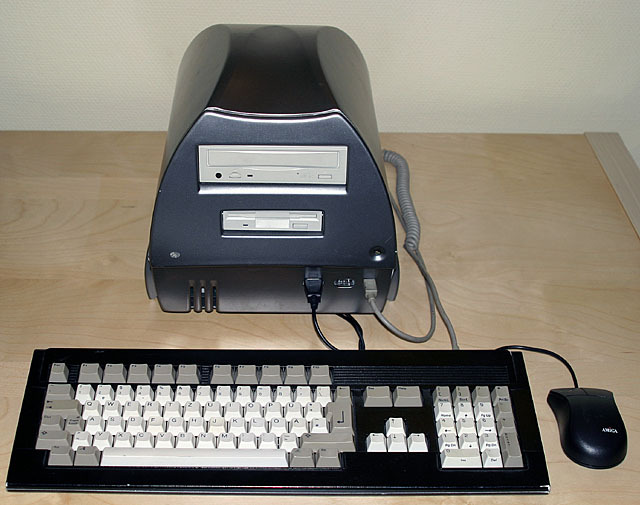 It was planned as a replacement for the A1200 with a faster CPU, better expansion capabilities and a built-in CD-ROM (possibly also Hard Disc). The case of course is unique and radically different from pretty much every computer before it. The system was based on the existing AGA chipset and a new chip called "Toni". The intention was also to make the motherboard available without a case so users could put it into a standard PC case. 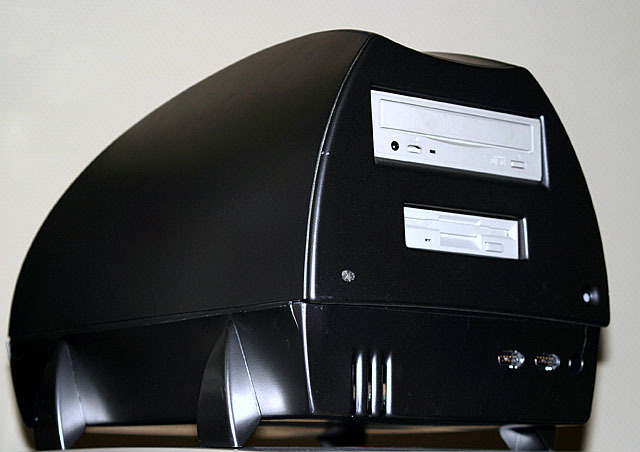 There were a number of other potential case designs of different sizes, the Walker motherboard would fit all of them allowing for more or less expansion depending on the users wishes. Unfortunately, despite Amiga Technologies' bravery in producing such a case, it didn't get a very good reception. Unfavourable comparisons were made with vacuum cleaners, Darth Vader's helmet and even Dr Who's electronic dog "K9". 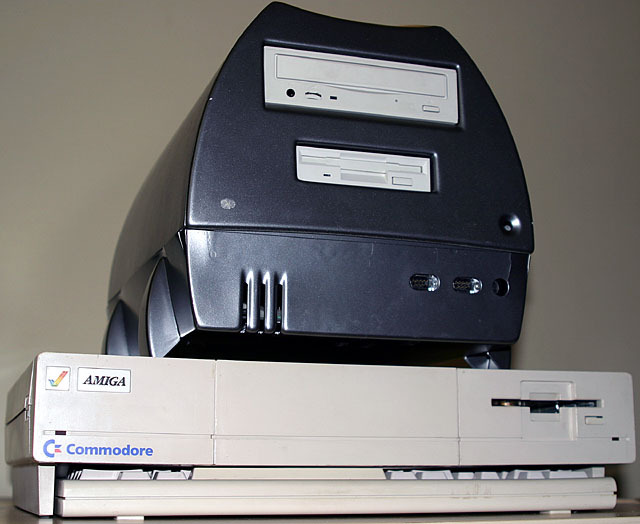 The Walker isn't just another Amiga however, it was the last Amiga to be made based on the original custom ship set and Motorola 68000 series CPUs. It also marks the end of the Amiga as a single community, it would go in several different directions thereafter. 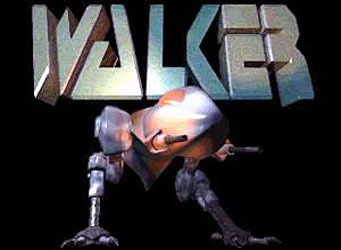 The Walker was planned to go on sale in September 1996, though it would have been fairly short lived as the following year a new PowerPC based Amiga would appear using standard PC parts (that was the plan, if they could have kept to that schedule will forever remain a mystery). Unfortunately these plans went west pretty quickly. Amiga Technologies' parent company Escom ran into trouble and Amiga Technologies was put up for sale. A buyer was found but while the plans for the Walker were still intact the new case and name were dropped, the plan was to put the board in a standard Amiga style desktop case and give the Walker a more traditional "A1500" type name. A German magazine even ran a competition to find a new name. 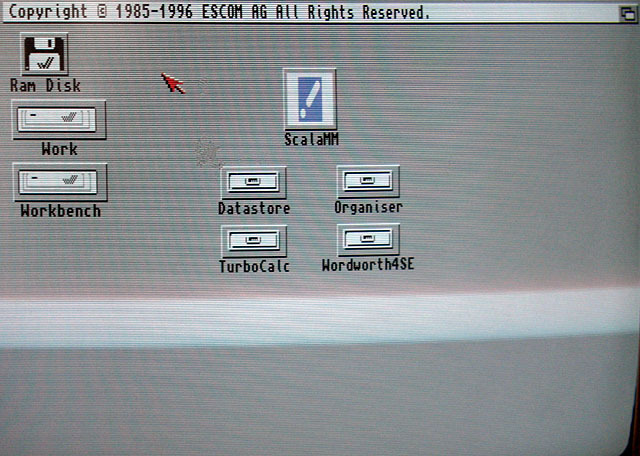 Later Escom went bankrupt and Amiga Technologies followed it when the sale fell through. That was the end of the Walker and with it the end of the original Amiga line. 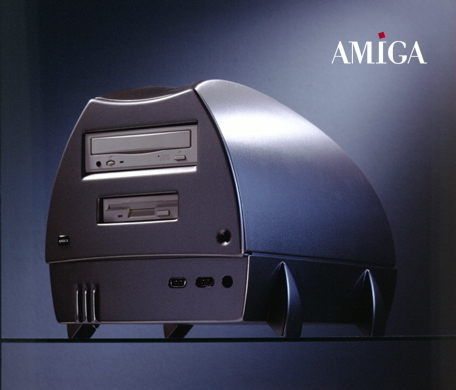 Subsequent Amiga and Amiga-like systems would use the PowerPC series CPUs and off-the-shelf chips or emulation. 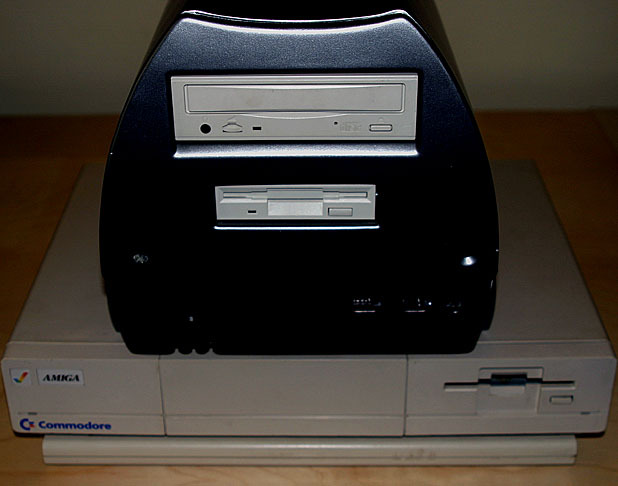 There were only two prototypes made and these were sold to Petro Tyschtschenko, who had been Amiga Technologies' CEO. One of these later passed to Thendic-France and then to me at an auction along with the drawings of other versions. The Walker case design was later said to have been sold to US firm Merlancia in 2001. A number of Walker motherboards were made but only 2 were put in the cases. I know of one green case, it apparently sat in Petro Tyschtschenko's office, it's not known if this was one of the two fitted with boards. Full 68030 / 33 Mhz - (may not be running at this speed). Due to the unusual shape I have also given some additional measurements. Due to the flexible nature of the case these are not exact. Judging from the the prototype the project never got very far beyond an early stage. There is a functional motherboard but it contains quite a number of patch wires and additional components which have been added to get it to work. At least one more motherboard revision would have been necessary prior to production. The case is at an even earlier stage, it appears to have been built to see how it looks and gauge public reaction. It is made of a very thin plastic and the lower section has a number of cracks in it from being moved, it is very fragile and is highly unlikely to survive any punishment whatsoever. Some changes would need to be made due to the ports at the back and front not fitting, the production design could then be developed. The internal mechanical structure is at the earliest stage of all consisting of nothing more than a few bits of metal cut to size and holes drilled in them. Removing the Hard Disc requires everything to be dismantled. It would need considerable work before any production could commence. Walker Workbench. Note the copyright is attributed to ESCOM AG. Sort of, When powered up it seems to go into a boot cycle which it cannot complete and either stops or just keeps rebooting. It can be made to get beyond this stage complete with a partial Workbench load but it halts on the error "Not a DOS disk in SDH0". Eventually with patience it can eventually be made to boot. This Walker was seen working in late 2002 at the Aachen Amiga show after the "Coyte Flux" brothers managed to get it to work. The performance is said to be slower than a stock A1200 but this is likely a board problem which would have been solved before production. 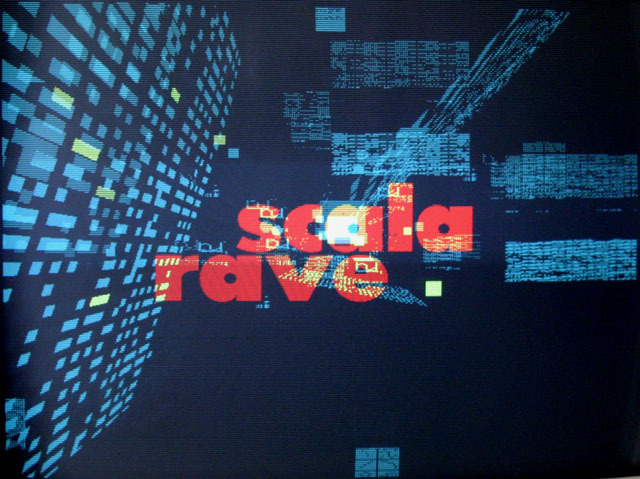 Applications such as Scala work. The Walker would have looked way cool in black! 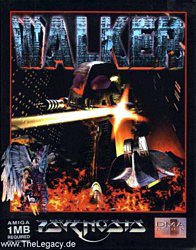 Another Amiga Walker was the game produced by Psygnosis. This Mindwalker game comes from early in the Amiga's history. 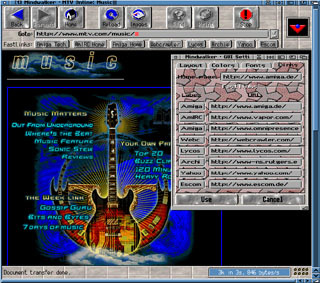 Some of the Game Music (4MB MP3). Mindwalker (originally planned as Wyndwalker) was possibly the first Amiga Game and was apparantely bundled with the A1000 (at least in Germany). Nearly 20 years later it's now being bundled with the emulation package AmigaForever 6.0. 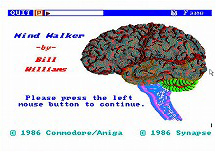 Mindwalker was a written by Bill Williams who produced a series of games for the Atari home computers and later moved onto the Amiga. Bill seems to have been one of the most imaginative games writers ever producing some truly original ideas. Sadly he died in 1998. Here's a review of Mindwalker. It was really just a renamed version of Voyager. Walker Working - The Walker will, with some persistence eventually boot, this is what is seen. Walker Working more - It can also boot of the floppy and UAE can run the Walker's Workbench 3.2. Inside the Walker - For those interested in seeing the insides of the Walker, this page has a number of pictures and lists the components. Other Walker Designs - There are designs for other Walker casings, this page has pictures of the drawings. Public Showings - The Walker has never been seen much in the flesh, here's pictures of these rare appearances. The some good technical details can be found here. I borrowed this from http://www.amiga-hardware.com/, hope they don't mind. See comment in bold below! Only 2 Walkers were made - confirmed. 3000 Visitors in just over a week. If you know any more of the Walker's story please let me know. If any of the details above are incorrect or I have included any pics I shouldn't have please let me know.